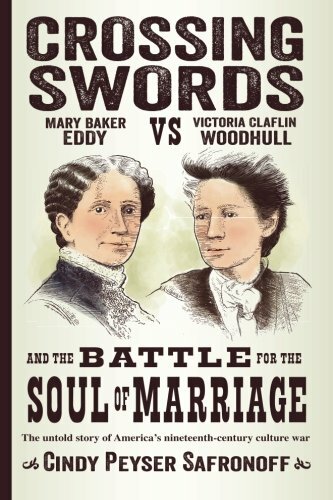 In “Crossing Swords: Mary Baker Eddy vs. Victoria Claflin Woodhull and the Battle for the Soul of Marriage,” Cindy Peyser Safronoff presents readers with a comparative biography that looks into the lives of two women who were highly influential in the feminist movement during the latter half of the 1800s. One, Mary Baker Eddy, was a defender of Christian/Puritan values and the sanctity of marriage, yet she saw need and opportunity for improvement in women’s rights. The other, Victoria Claflin Woodhull, was more radical in her approach to seeking equality for women and was a strong proponent of ‘free-love’ and the ability for women to remove themselves without consequence from the bonds of marriage. Though the two never met, together – with other feminist leaders like Susan B. Anthony, Mary Livermore, and Lucy Stone - they voiced the concerns of all women in finding equal footing in all areas of civilization, including laws dictating politics, marriage, and even religion. Author Safronoff digs deep into the past to reveal amazing parallels to modern day discussions about many of the same issues that existed over a hundred years ago. To say that Safronoff has done her homework is an understatement; the book is extremely well researched and documented with extensive notes and an index included. The author relies on an excess of quotes to move the stories forward, which got a little tedious, as did the extensive background on the Puritans. An understanding of the Puritans was necessary to put Eddy’s and much of society’s belief system in perspective, but it went into such depth that it seemed to take the story off course. However, the book provides plenty of information that may be new to readers including the basis of American Spiritualism, the formation of Christian Science, the circumstances around first female presidential candidacy, and the promotion of ‘free love’ as an alternative to marriage. "Crossing Swords" has broad-spectrum appeal because Cindy Peyser Safronoff writes intelligently without being overly academic; however, scholars will find much to ponder and appreciate. Anyone interested in the suffragist and women’s rights movements will enjoy the historical element, but the personal lives of Eddy and Woodhull are what make this book most enjoyable, thought provoking, and illuminating.